A detail view of the words THE BANK chiseled in stone. I recently had the opportunity to interview Daymond John, from the hit television show, Shark Tank and Keri Gohman, Head of Small Business Banking at Capital One about business trends for 2016. There are several opportunities that stand out this year for entrepreneurs to capitalize and grow their businesses. 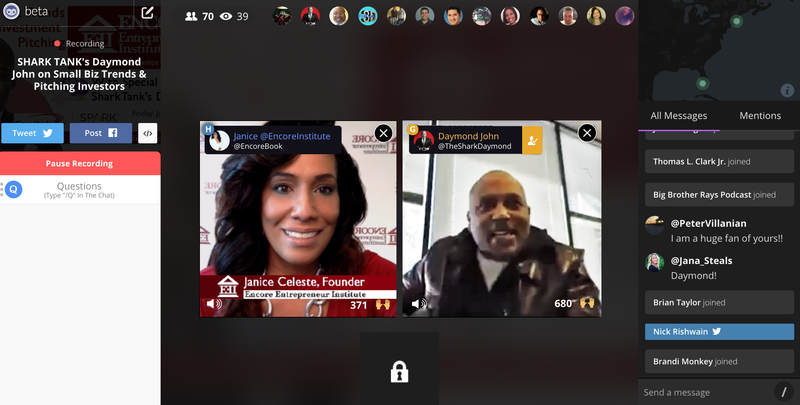 Janice Celeste, founder of the Encore Entrepreneur Institute interviewing Daymond John of ABC's hit television show, Shark Tank on her talkshow, ENCORE. The Digital Divide. This is a big one! Technology will play a huge part in marketing and if you understand how to play the game, then it will be easier to win. John talked about the social media generation gap. "The manufactures in my space, most of them are 40 and over, they don't want to understand social media...and the people who are setting the trends, consuming the goods are 15 to 29," says John. "The gap is going to get wider. The people who do understand it at a younger age...are finding their target market without a big budget...so they are starting their companies with little capital." Like Daymond John, Keri Gohman knows first-hand how important digital literacy is for entrepreneurs. "As technology evolves, there is a great need for small business owners be proficient in its use and application in order to compete, grow and prosper," said Gohman. "That's why, through Future Edge, we're investing 150 million over five years in community grants and support efforts to help more Americans - especially small business owners - get the skills they need to succeed in the 21st century." Cloud Technology for Startups. Cloud computing is making it cheaper and easier for anyone anywhere to be an entrepreneur. "If you're looking to start a business one of the things that is really fantastic about starting a business today is that the cost to actually start your business...with new technology, like accounting, payroll and [other] business products using cloud technology is actually much lower than they've been in the past," said Gohman. And "65 percent of business owners are...taking advantage of cloud technology." Business Apps. Small businesses benefit from creating mobile apps and more are using them to promote their businesses more than ever before. With mobile apps, you can be in contact with your target audience 24/7, reach new customers, and bring brand awareness to your company. "Historically, just two years ago, 30 percent of business owners were using mobile apps. Today that number is closer to 60 percent," said Gohman. Crowdfunding. Funding your startup idea is as easy as setting up a page on Kickstarter, Indiegogo, or GoFundMe to name a few crowdfunding sites. These sites make it easier than ever before for entrepreneurs to obtain startup capital. "People know that now they can get the initial startup capital they need, advertise and market their brand all at the same time and not have to give up none of their company," said John. Co-working Spaces. Business owners can affordably work in a coworking space instead of meeting clients at a coffee shop for probably cheaper than it is to order a large latte everyday. They are also exposed to a network of other entrepreneurs in these coworking spaces without having the isolation that's felt when working from home. These spaces are convenient for business owners with limited budgets. "I'm seeing coworking spaces such as WeWork and Regus. These are really blowing up," said John. "They work off their mobile phones and if they are in California, they go to a WeWork in California, and if they are in Florida, they go to a WeWork in Florida. These trends may not be a perfect fit for every business but those who can take advantage of them could find their businesses ahead of the game. What do you think? To learn more, click below to view Daymond John's interview and click here to view Keri Gohman's interview. Janice Celeste is the founder of the Encore Entrepreneur Institute, an advocacy organization for entrepreneurs ages 50+. You can follow her on Twitter and on her Blab live stream show, ENCORE @EncoreInstitute.